My ancestors have guarded French estates for centuries and were formidable hunters of boars, wolves and bears. I am known for my fearlessness and strong will. My breed was first introduced into the United States in 1960 and I have gained a strong following among the ranks of those who appreciate and respect my talents. I am fond of children and make a loyal family guardian, but obedience training while I am young is necessary so that we can all understand the rules that I am expected to follow and I can learn proper social skills. Some of the members of my breed are agressive toward other dogs, though, and that is hard for me to overcome. The breed standards given here for height and weight are often surpassed these days, because I have some really, really big friends out there! When fully grown, I am between 23 and 27 inches tall (58.4 to 68.6 centimeters) and I weigh between 84 and 120 pounds (37.8 to 54 kilograms). � 1996 - 2008 Dogs4Sale.com. All rights reserved. Photo � 1996 - 2008 TATM Comunications All rights reserved. Used under written license. 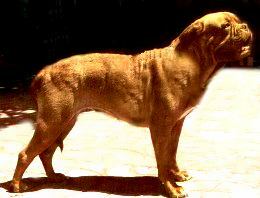 We have no Dogue De Bordeaux Breeders listed at this time. Click here to place your Dogue De Bordeaux Ad!